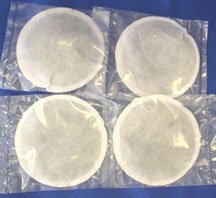 The 4 pack of replacement carbon filters is a about a one year supply. Just put the filter pillow in the stainless steel filter cup. Your distilled water never comes into contact with any plastic. The shelf-life for the filters is virtually unlimited.